Just to follow up on John Sayers’ baseball mystery, I thought I’d tell a tale of my own that shows how much fun it can be to solve a postcard puzzle of just that sort. This particular card was one of several teams whose identities I was able to pinpoint, eventually, and (in this case) after having learned a lot about a little known corner of Canadian history. The card shows what is clearly a high school team, with its gentlemanly teacher-coach. A noteworthy feature of the card, which would have required a bit of photographic expertise and effort to achieve, is that one player is shown in an inset photo. There is nothing to say which team it is and the monogram visible on the team’s sweaters is one of those that isn’t easy for the modern eye to interpret. The boy in the inset photo — who proved to be the key to solving the mystery — was named in full: Leslie Isaacks. A search on Ancestry.ca quickly revealed the sad news that a Leslie Raymond Isaacks, schoolboy, had died at Kingston, Ontario on 16 June 1931 at the age of 16. Leslie was a son of Charles and Sophie Isaacks, English immigrants who were Baptists — an important detail, as it turned out. The information about Leslie Isaacks was interesting, but something didn’t fit. If this was a high school in Kingston, why were so many of the surnames French-Canadian? Another curious fact struck me: “Mr. Massé” is described as “pastor”. Not a priest but a pastor. It sounded as though, very unusually for someone who was (presumably) French-Canadian, he might have been a Protestant … and quite possibly a nonconformist Protestant, such as a Baptist (Leslie Isaacks’ religion, as I’d just discovered). Hmm… I checked online for the next most complete and distinctive name: Nelson Auclair. Ancestry.ca yielded up the lad’s birth registration, which was in Marieville near St-Hyacinthe, Quebec. Sure enough, young Nelson was also a Baptist. Moreover, he had been baptized in 1913 by none other than G. N. Massé, pasteur. Searching for G. N. Massé on Google brought to light the interesting history of French-Canadian Baptists in Quebec and particularly of the Feller Institute (or College), established in the 1840s in what was then Canada East by Baptist missionaries from Switzerland. An old history of Quebec’s French-speaking Baptists found online (in a very poorly OCR’d version) tells the interesting story of the Swiss Baptists’ arrival in Lower Canada and the not always welcoming response of local Catholics. It also makes reference to G. N. Massé and his brother, Arthur Massé. Wikipedia recounts the later history of Feller College, which was located in the village of Grande-Ligne south of Montreal (since renamed St-Blaise-sur-Richelieu), down to 1967, when it closed for good. So, the pastor in the photo is one of the Massés, or perhaps a son who followed them in a life of service to the church. And that hard-to-interpret monogram is an “F”, for “Feller”. Why then is Leslie in an inset? Well, it appears from his death certificate that he had been undergoing treatment in Kingston, his hometown, for two months prior to his death in June. So perhaps he had had to leave his mates behind in Quebec before the team photo could be taken and, not wishing to forget him, they had the photographer insert a photo that had previously been taken of him in a track or basketball uniform. If so, that would plausibly date this image to the winter or spring of 1931. Another mystery solved. And here’s to Leslie and his friends, the Feller College hockey team. They’d have to be at least 100 years old to be alive today, but I’d be willing to bet that for as long as they may each have lived, not one of them ever forgot their lost teammate. 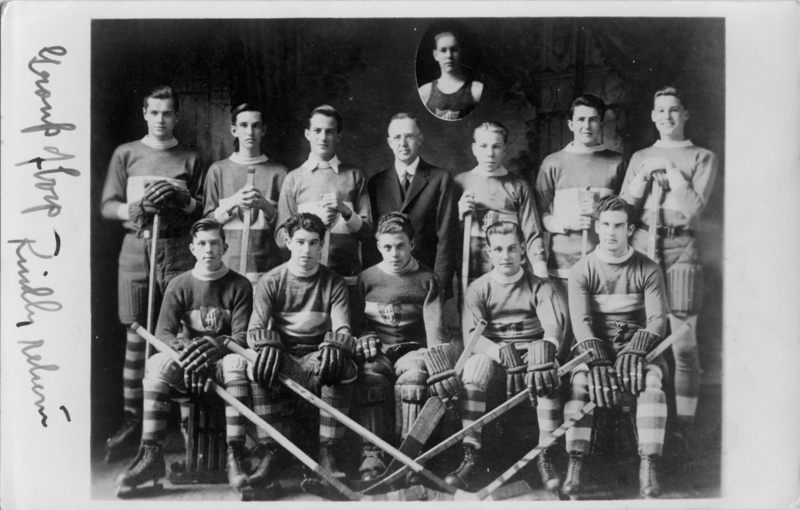 Tagged 1931, Baptist Church, Feller College, Hockey, Team Photo. Error: Error validating access token: Session has expired on Friday, 12-Apr-19 20:21:58 PDT. The current time is Friday, 19-Apr-19 21:16:17 PDT.